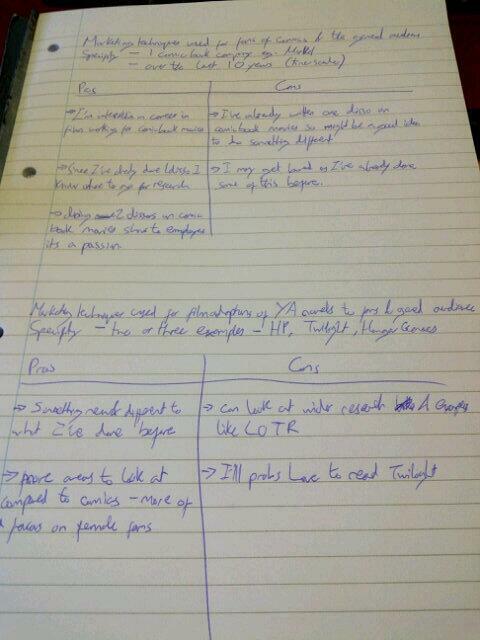 My mother taught me well so I’ve done a pros and a cons list for both comic books and YA novels. To be honest they both were quite equally in their pros and cons so that didn’t really help that much. After talking to both my lecturer and my mother I have come to the conclusion that I’m going to write about the marketing of comic book film adaptions from the last ten years (it may change to the last fifteen years once I’ve looked at what films were released in that time). Comic book movies (and Marvel especially) are a real passion of mine – my undergrad dissertation was titled “An Analysis of Marvel Studios as an Example of How Hollywood Works” – but because I wrote about Marvel for my undergrad I wasn’t sure if I wanted to focus on comic books again even though it is in a different area. However, to a future employer seeing that my area of interest has remained consistent over a number of years shows that I’ll have an in-depth knowledge of that area and of marketing techniques. Plus working on something that I’m interested in and passionate about will really help when I’m in the library at 11 o’clock at night in the middle of summer. I ended up choosing comic book adaptation because I have more ideas for it compared to YA novels. I can look at casting decisions, Comic Con, and not just focus on DC and Marvel but look at film adaptations like The Losers, V for Vendetta, and Watchmen. The only thing I had with YA novels was that maybe I’d look at Harry Potter, Twilight and The Hunger Games. Also at my university there are lecturers on hand who know way more about comic book adaptation than they do about YA so would be able to point me in the right direction more easily. Now I know what I’m doing I’m looking forward to starting the research – I already know who my supervisor is so I’ll be able to get guidance from him. But first I need to get this proposal written up. That’s a task for this weekend I think.